Cozy cabin in the Village of June Lake, close to the shore of June Lake! Surround yourself with the beautiful High Sierra Nevada Mountains, crystal clear alpine lakes and a wonderful vacation experience. Surround yourself with the incredible High Sierra Nevada Mountains, crystal clear alpine lakes and a wonderful vacation experience. Surround yourself with the scenery of the High Sierra Nevada Mountains, crystal clear alpine lakes and a wonderful vacation experience. Surround yourself with the scenic High Sierra Nevada Mountains, crystal clear alpine lakes and a wonderful vacation experience. Within one mile of this gorgeous vacation home you can enjoy two glacial lakes full of trophy trout, and the June Mountain ski area. Luxury Victorian home in the heart of June Lake Village, over 2,800 Sq. Ft. Outdoor fire pit for evening relaxation! 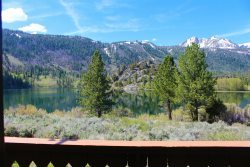 Enjoy this 3 bedroom vacation home centrally located in downtown June Lake Village.